Hello dear cooking blog. Please accept my apologies for being away for so long. But I am back and I thought this dish would help make up for my long absence. I just love a nice savory stick to your ribs risotto. While I was rummaging through the fridge looking for something to throw together for dinner I spied some leftover roasted squash. I am growing weary of the typical squash soup and thought maybe I could incorporate this into some risotto. Yes! I still have some decent fresh sage in the garden – a perfect match with squash. And for some protein I have these delicious chicken sausage with asiago cheese and spinach in the freezer. Perfect! If you’ve followed my cooking exploits for a while you might know that I tried to make a healthier version of seafood risotto a while back using barley. 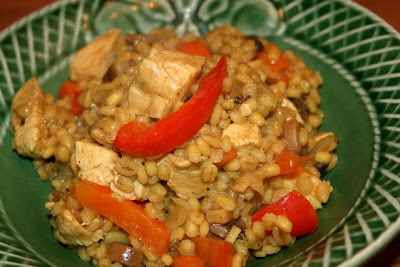 It turned out well then and I’ve done another barley risotto this time using chicken and Indian curry flavors. 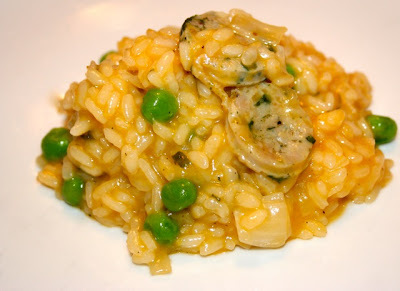 Of course you can add whatever flavors you like to a basic risotto method. This is just what I had on hand last night when I was throwing together dinner at the last minute. For this risotto I used the following ingredients. I started by heating a large flat pan. In went the olive oil followed by the onions, carrots and mushrooms. They were seasoned with salt, pepper, curry powder, and asafoetida and cooked together for a few minutes until they began to soften. Then I threw in the garlic and barley. These were tossed together in the pan for about a minute. Then began the risotto process. I added a couple cups of beef stock to the pan. This was cooked with stirring now and then until the stock reduced. More stock was added in small amounts and stirring/cooking was continued until the barley was toothsome but tender, about 35 minutes. I then added the chicken and pepper. I made sure there was enough liquid for it to cook for another 8-10 minutes. This was cooked down until the broth was all absorbed and the chicken was cooked thoroughly. Next time if I were to plan this I would add some lemon juice at the end to give it more zing. I might also add some green chilis to the mix to give it more fire. Of course if I had fresh cilantro that would be added to the top after it was plated up. You can’t really go wrong with this. I can envision a Thai inspired version using green or red curry paste for flavor and some coconut milk/chicken stock for the broth.